I always loathed mince pies as a child, all that candied peel just didn't appeal to my taste buds one bit. With these mince pies there's not a piece of candied peel in sight, the orange and lemon are puréed so they still add the flavour without having the lumps of peel to chew on. Make the mincemeat filling 24 hours ahead of making the mince pies to allow the flavours to really infuse the mixture. To make the recipe processed sugar free then simply leave the sugar out of the pastry, or substitute with a couple of drops or one single serve packet of Stevia. To make it dairy free simply swap any dairy with your favourite non-dairy substitution. Mix the cranberries, currants, sultanas, cherries & mixed spice in a large bowl. Put the coarsely chopped ¼ of apple, the lemon, and orange pieces into a blender and purée. Keep the finely chopped other ¼ of the apple aside. Mix the fruit purée and the finely chopped apple into the dried fruit. Add the brandy (or substitution) and mix well. Refrigerate in a sealed glass jar for 24 hours, mixing occasionally to ensure all the brandy (or substitution) is soaked into the fruit. Use as required. Lightly butter or oil muffin trays and lightly flour them with gluten free flour. To make the pastry put the flours, butter, xanthan gum and sugar into a large bowl and mix until it resembles fine breadcrumbs. Add the egg yolk and enough water to bind the dry ingredients together without making it wet and sticky. If the pastry is too wet add a little more gluten free flour. Cover the bowl with clingfilm and place in the refrigerator for 30 minutes. Roll out the chilled pastry on a lightly gluten free floured surface until it is approximately 5-6mm thick (just under ¼"). It's best to do this in small batches as the pastry will dry out quickly and turn crumbly. Using a floured cutter cut out circles of pastry that are slightly larger than the muffin tray holes, place the pastry over each hole and very gently ease it into the base. The best size of pastry circle is one that will line the muffin case to the top without sticking out, if it does just trim off with a sharp knife. 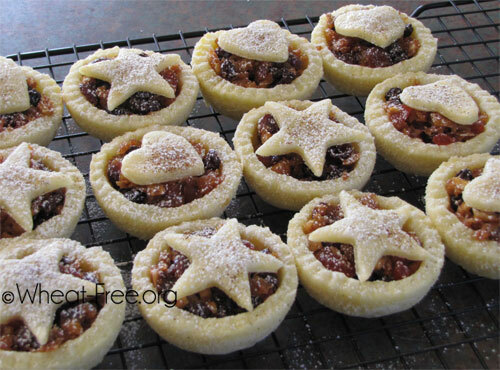 Fill each pastry case with the pre-prepared or readymade mincemeat. Roll out the remaining pastry (you can make this a little thinner if you wish) and cut it into fancy shapes with small cutters making sure that the shapes are smaller than the internal diameter of the mince pies pastry case, place on top of mincemeat filling. Brush the pastry tops with beaten egg or milk and lightly dust with caster (superfine) sugar and cinnamon (optional). Place in the oven for 20-25 minutes or until the pastry tops are lightly browned and crisp. Allow to cool for 15 minutes in the tins before removing onto a cooling rack. Before serving lightly dust with confectioners sugar. These mince pies are delicious served hot or cold. They will keep in an airtight container in the fridge for 2-3 days, or can be frozen. I recommend that you warm them for a few seconds in the microwave to really enjoy the fragrant filling.